"TOKYO (MarketWatch) -- Sony Corp. (6758.TO) will reach only 75% of its global target for PlayStation 3 sales this fiscal year through March, according to a Nomura report released Monday.Nomura cut its target for PS3 game units shipped during the period to 4.5 million from 6 million, citing poor sales over the holiday season in North America.The Tokyo-based consumer electronics maker is fighting to keep its position at the top of the video game market against rivals Nintendo Co. (7974.TO) and Microsoft Corp. (MS). The company's rollout of its newest system has been beset by delays and supply shortages, but it has maintained it will sell 6 million units through March.Sony said last week it had shipped 1 million consoles in the U.S. in 2006, but it sold only about 470,000 in Japan according to data released by computer game publisher Enterbrain Inc. This put it well below its global goal of 2 million for the year.The unit is due to be released in Europe sometime in March.In its report Monday, Nomura also cut its PS3 sales forecast for next fiscal year to 10 million from 16 million next fiscal year and to 11 million from 18 million for the following year." "IDC analyst Billy Pidgeon has told GamesIndustry.biz that Sony must produce more first-party software for PlayStation 3 or risk seeing more and more units left on shop shelves.Pidgeon's comments follow the release of NPD's videogame sales data for 2006 which, according to SCEA boss Jack Tretton, show "the power of PlayStation".The IDC analyst said he agreed with Tretton that the power of the brand "is confirmed with the PS2's performance in the market", adding that sales of hit titles such as Guitar Hero 2 meant that last year "PS2 was helpful to most third-party publishers' bottom lines".However, he continued, "The PlayStation brand doesn't appear to be helping the PS3. If NPD's numbers are correct, there are over 300K PS3s on retail shelves. That is not good for a console launch of only a million and it's not good for publishers with PS3 software. "Pidgeon warned that Sony must focus on the games available for PlayStation 3 and the number of first-party titles in development, stating, "Software libraries are the key driver of console sales, and no console is going to sell on the promises - they've got to deliver. "Sony needs more must-have first party titles to sell consoles. Gamers know Halo 3 is coming on the Xbox 360, and they can expect Mario on the Wii, but there are no established first party franchises coming to the PS3 except Gran Turismo - and that is delayed. "Pidgeon did say that first-party PS3 games Heavenly Sword and Motorstorm "look great", but observed, "They are new and less anticipated." 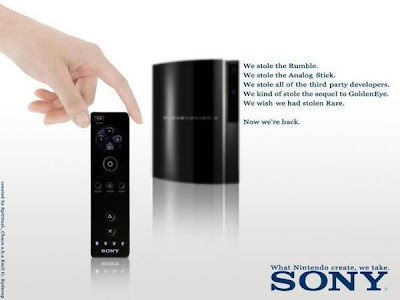 Sony relying on the Playstation brand name has not helped them sell the PS3. Most people feel that the 360 is a much better system and easier on their pockets at this point in time. Meanwhile, Nintendo is raking in the cash with the Wii. You get the feeling that if Nintendo had 10 million Wii's to sell, 10 million would have been sold quickly. The demand is not stopping for the Wii, but the PS3 looks like it was a holiday EBay grab up for people trying to make a quick buck. Cheers to that one Japanese guy that sold his PS3 on EBay for $25,ooo! That won't work now since the PS3's value is at normal cost (or less in some cases). My point is that people can see through sly marketing and it looks like Blue-Ray, and the Sixaxis controller was a huge bust so far for Sony and the proof is all the systems sitting on the store shelves collecting dust. Whatever Nintendo does, Sony copies. This time they were a little bit late and it's not fooling too many people.